A ceremony recessional is one of my favorite moments to capture on a wedding day! Prior to the ceremony, the couple tends to be excited and a little nervous. At the conclusion of the ceremony, I always see such excitement as the bride and groom start to interact with their guests and share in their happiness! 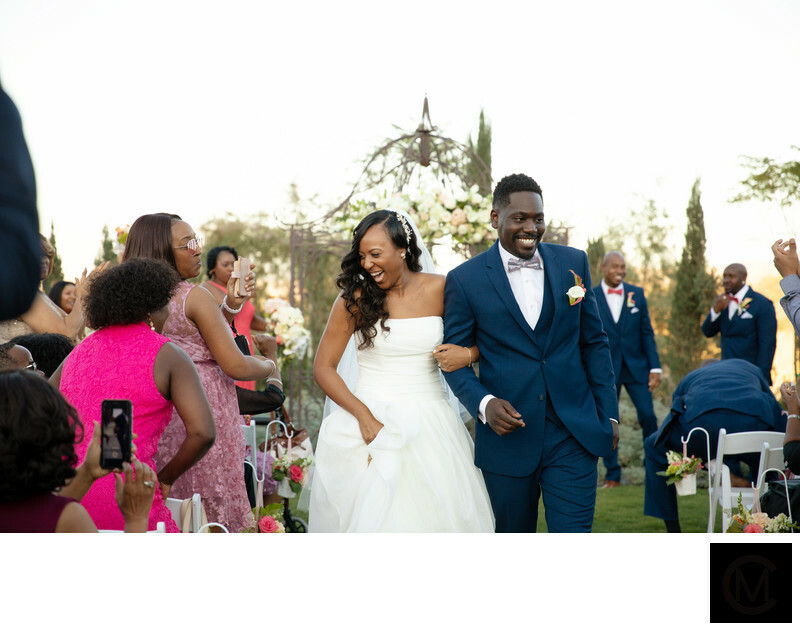 The image of Kenya + Wasani took place at a fall wedding ceremony at Eagle Glen Golf Course in Corona, California. Eagle Glen is surrounded by lush green hills and mountains, as typical for event spaces in the Inland Empire. Their wedding ceremony took place during sunset, which is one of the most gorgeous times to get married! The golden light in the background looked amazing as they declared their vows to one another. Below are some additional images of the wedding ceremony at Eagle Glen Golf Course.